We write with great concern about reports of UAE officials maintaining clandestine prisons in Yemen. The June 22nd AP report which so deeply troubles us described gruesome tortures happening inside the secret prisons. tortured, U.S. officials have possibly interrogated people who have been subjected to torture. Within Yemen, stories about torture and disappearance of prisoners must have an extremely chilling effect on any individuals or groups who would attempt to demonstrate on behalf of their loved ones who have disappeared and who fear that their loved ones have been tortured. Recognizing that it would be quite difficult for Yemeni people to reach your Embassy here in the U.S., we are assembling here today to raise questions: How specifically does the government of the United Arab Emirates respond to each of the allegations made in the June 22nd, 2017 AP report? What information can you offer regarding the presence of U.S. interrogators who acknowledge having been in Yemen? How has the government of the United Arab Emirates responded to the estimated 2000 people in Yemen who have claimed that their loved ones have disappeared? Recognizing that the UN regards the humanitarian crisis in Yemen as the worst in the world, as people face conflict-driven famine and disease, we feel increasing urgency to alleviate the suffering people face and help abolish any networks of clandestine prisons and any usage of torture by any of the warring parties. Members of Witness Against Torture fasting in Washington, D.C.
We invite you to join us in community in Washington, DC, January 7 – 14, for Witness Against Torture’s 2018 Fast for Justice. Please let us know you’re coming– for the week or any part of it– by sending an email to witnesstorture@gmail.com. We will gather for a week of events marking a tragic and ongoing history: After 16 years, the US detention camp at Guantanamo remains a living symbol of US torture and human rights abuses and a place of misery for the 41 Muslim men it still houses. Five of the men have been long cleared for release and yet still languish there. The Trump administration is holding 26 of the detainees for indefinite detention without charge or trial. The Pentagon has plans to try only a small handful of the prisoners. It is easy to lose hope in these troubling times. Yet we know that hope resides not in calculating future probabilities, but in bearing witness to injustice in this present moment. It resides in lifting up human dignity. It resides in imploring our fellow citizens not to turn their eyes away. And so, once again, we gather. Sunday morning: breakfast, circle and closing ceremony; depart. Author Mark Fallon presents Unjustifiable Means: The Inside Story of How the CIA, Pentagon, and US Government Conspired to Torture, at Kramerbooks at 1517 Conn. Ave. NW, Washington, D.C. 6:30 pm. Please join Witness Against Torture, the Peace Poets and friends for a book launch and performance on the eve of our annual January 11 demonstrations against Guantanamo. The book, There is a Man Under that Hood, collects highlights from eight years of anti-torture photography curated by Justin Norman, and pairs them with Luke Nephew’s powerful poem by the same name. The contents are book-ended by a foreword from WAT’s Jeremy Varon and an afterword from Omar Farah, Senior Staff Attorney for the Center for Constitutional Rights. The Peace Poets will perform pieces from current human rights struggles. UK author Andy Worthington will address the state of Guantanamo in the era of Trump. And legal advocates will report on the fate of their clients still in the prison. 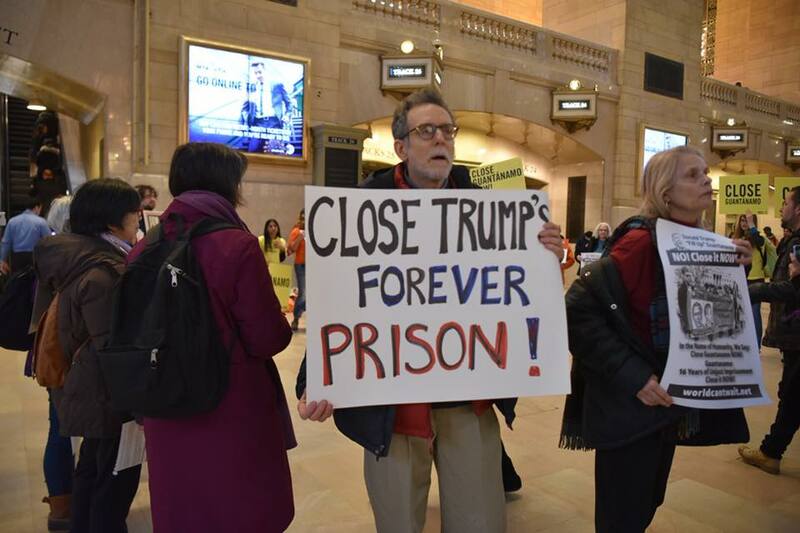 Together we will celebrate our resistance to torture and work to close Guantanamo. The 72-page book is available for pre-order in hardcover for $25. Release is set for January 10th, 2018. The proceeds will be used to further the human rights work of the creators. 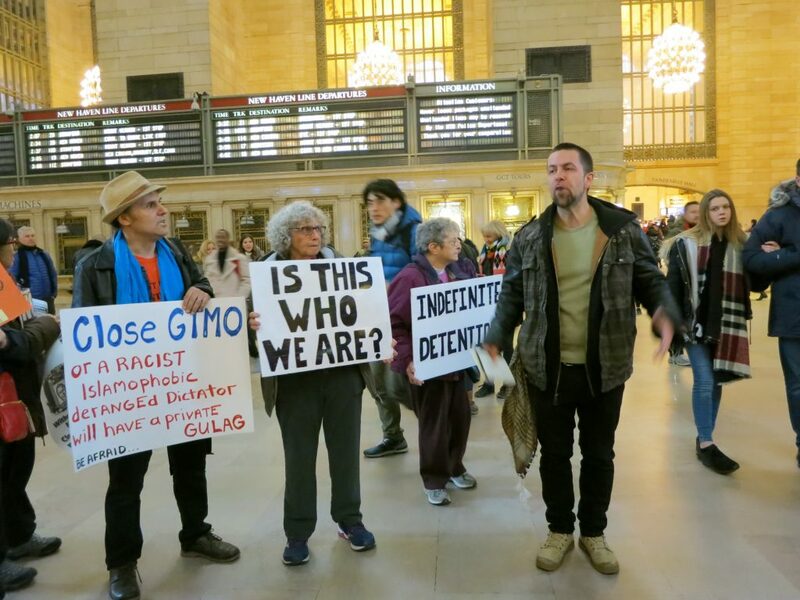 Please join human rights activists, torture survivors, Guantanamo attorneys, 9-11 family members, ex-military officials, and members of diverse faith communities in Washington, D.C. on January 11, 2018 as we rally against Guantanamo, indefinite detention, and Islamophobia and call for the immediate transfer of the cleared detainees. The rally at the White House will begin at 11:30 am. Just days after Donald Trump retweeted anti-Muslim propaganda, the Supreme Court decided to implement Muslim Ban 3.0 while the lower courts adjudicate the ban’s constitutionality, by kicking the case back to the 4th and 9th Circuit courts. However, they have allowed the racist, xenophobic, Islamophobic and anti-Muslim ban to go into effect in the meantime. See this op-ed from the ACLU. Here’s a link to the livestream video of the rally. On November 30 and December 1, several hundred people gathered in Raleigh, North Carolina for an extraordinary event: the public hearings of the North Carolina Commission of Inquiry on Torture. Over two days, eight commissioners heard riveting and often heart rending testimony about the global rendition and torture program undertaken by the United States following the 9/11 attacks. The witnesses included the world’s leading rendition researcher; military, ex-military, and ex-intelligence officers outspoken against torture; legal experts on human rights; psychologists who treat torture victims; and, via Skype, survivors of US torture. The Commission grew out of local, North Carolina efforts to protest Aero Contractors — a private airline company contracted by the CIA to carry out likely hundreds of rendition flights ferrying US captive to torture by the CIA or foreign governments. The commissioners will author a report based on the hearings. The NCCIT hearings were a landmark event. The Bush administration sought to define out of existence, conceal, and immunize grave crimes. The Obama administration chose not to prosecute potential perpetrators of torture operating under legal directives from Bush’s DoJ. Several lawsuits targeting torture policies have been dismissed from federal and international courts for reasons of executive privilege, state’s secrets provisions, and pressure from the US government. It has therefore been up to civil society actors like the NCCIT to provide at least symbolic forms of accountability for years of US torture. The hearings further educated the public about US conduct, solidified the legal case that torture occurred, and may help to deter future uses of torture by fortifying a public narrative that it happened and that it was wrong. The hearings also brought victims of torture into a judicial-style inquiry, simulating forms of due process that has been denied them. For more on the hearings, including links to media and video archive of them, go to the NCCIT website. We Must Resist: Join WAT in DC in January! For 13 years Witness Against Torture has championed the cause of the Muslim men unjustly imprisoned at Guantanamo, also using our witness to shine a light on other U.S. institutions of racist, Islamophobic state violence. Now, as our outrageous Narcissist-In-Chief distracts the world, those very institutions are quietly cementing into place and strengthening the security state that is stripping entire groups of people of due process rights and protection under the law. We must resist: come to DC in January to witness in community with us and to engage the future together! We come together not only to call for the closure of Guantanamo and its legacy of institutionalizing Islamophobia, but also to invite our government and fellow citizens to choose the side of love, mercy and justice. We demand an end to policies that maintain racism, mass incarceration, and fear of our neighbors. We come together to envision the world we want to live in where justice and equality reign. We hope you will join us for a week of actions and fasting from January 3-12, 2017 in Washington, DC and our presence at the presidential inauguration January 19-21. We will start fasting from the evening of Jan. 3rd and break our fast on January 11 in the morning. If you cannot make it to DC, but are considering fasting during this time – let us know. We will organize a conference call for everyone fasting across the country and we want to include you. If you can only come for one day, join us for the rally with our coalition partners on January 11th. Location is TBD. We will also engage in creative actions around DC between Jan. 4-12 – contact us if you are interested in participating. Jan 10 we will host a cultural event in collaboration with the Tea Project – more details coming soon. We also invite you to join us from afar, to participate in our solidarity actions and to organize actions in your own communities to raise awareness of torture and indefinite detention at Guantanamo Bay. Jan 10 we will host a cultural event in collaboration with the Tea Project – Space is limited so please RSVP here : https://ccrjustice.org/wordsfromthegrassroots#. For more info and to RSVP, email us: witnesstorture@gmail.com. The latest updates are on our Facebook event page. Today marks the second anniversary of Adnan Latif’s death. And still there has been no independent investigation regarding the true cause of his death. As we continue to call for justice for all the Guantanamo detainees, demand an end to indefinite detention and torture and that Guantanamo be closed, let us not forget those who died at Guantanamo, including Adnan Latif. Adnan Farhan Abdul Latif (December 27, 1975 – September 8, 2012), also known as Allal Ab Aljallil Abd al Rahman, was a Yemeni citizen imprisoned at the U.S. military prison at Guantanamo Bay, Cuba, from January 2002 until his death in custody there. Adnan Latif was in a car accident in 1994, during which he suffered significant head injuries, which left him with on-going neurological problems. Latif said he traveled from Yemen to Pakistan in August 2001 to seek medical treatment, while the U.S. government alleged he went there to receive military training from affiliates of al Qaeda. He was captured in December 2001 at the Pakistan/Afghanistan border in a widespread dragnet of Arabs, and brought to Guantanamo prison in January, 2002. Immediately after his imprisonment, Latif and Guantanamo prisoners generally were blocked from filing habeas corpus petitions because of PresidentGeorge W. Bush‘s doctrine that “war on terror” detainees were not covered by the Geneva Conventions, and so could be held indefinitely without charge and without an open and transparent review of the justifications for their detention. In June 2004, however, the United States Supreme Court ruled, in Rasul v. Bush, that Guantanamo captives had basic habeas corpus rights, to be informed of and allowed to attempt to refute the allegations justifying their detention. 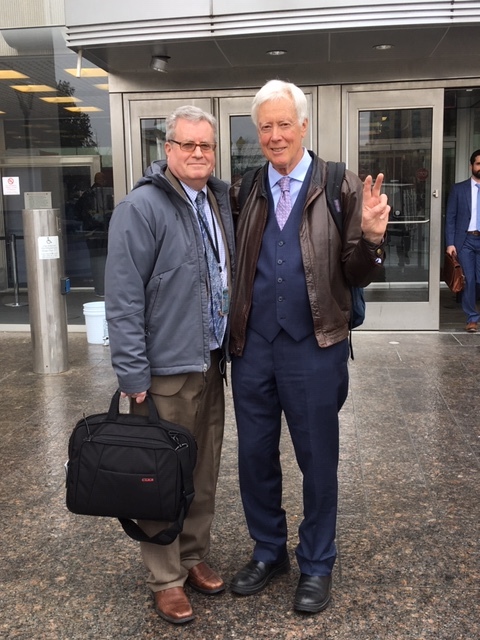 Latif attorneys Marc D. Falkoff and David Remes filed a habeas corpus petition on his behalf in 2004. Following the Supreme Court Rasul ruling, in July 2004 the Department of Defense set up its Combatant Status Review Tribunals (CSRT). Scholars at theBrookings Institute, led by Benjamin Wittes, would later, in 2008, list detainees still held in Guantanamo, and the CSRT allegations against them. The allegations were as follows regarding Adnan Latif: the military alleged he was an al Qaeda fighter and operative, that he went to Afghanistan for jihad, that he “… took military or terrorist training in Afghanistan,” and that he “… fought for the Taliban.” Further allegations were that his name or alias had been found “on material seized in raids on Al Qaeda safehouses and facilities,” and that he served on the security detail of Osama Bin Laden. Annual CSRT status review hearings were held in 2004, 2005, 2006 and 2007, and there is evidence Latif attended his 2004, 2005 and 2007 hearings. Late in 2005, Guantanamo detainee habeas corpus rights were again restricted and largely replaced with a much more limited review known as “DTA appeal, after United States Congress passage of the Detainee Treatment Act of 2005 and the Military Commissions Act of 2006. However, in June 2008, theUnited States Supreme Court overturned provisions of those laws and restored detainee access to habeas corpus. The decision was, however, appealed and a three judge DC Circuit Court of Appeals panel over-turned the ruling in an October 14, 2011 split decision which granted government allegations stronger credibility. The Supreme Court decided not to review the appeals court decision. A half-dozen soldiers in body armor, carrying shields and batons, had forcibly extracted him from his cell. His offense: stepping over a line, painted on the floor of his cell, while his lunch was being passed through the food slot of his door. Guantanamo’s Psychiatric ward, where Latif was reported to have been confined. The Associated Press reported on May 11, 2009 that Remes said that Latif had slit his wrists during his most recent visit. Remes said that Latif had used the edge of a strip of broken veneer from the side of a table in the interview room to sever a vein in his wrist, and used the interview table to hide his bleeding wrist from others and the room’s video camera. Remes stated that Latif had tried to commit suicide before, and therefore had at times been confined to the prison’s psychiatric facility. Remes also said Latif needed mental health care, but all camp authorities were doing was attempting to keep him subdued. A December 10, 2012 article at Truthout reported that Latif had written a letter to Remes complaining of his treatment at Guantanamo. Dated May 28, 2010, Latif complained in the letter that guards were placing contraband items, such as scissors, in his cell. “The way they deal with me proves to me that they want to get rid of me, but in a way that they cannot be accused of causing it,” he told his attorney. The same article reports that on two separate instances in 2010, camp officials tried to get Latif to fire Remes. On one of these occasions, he was given an injection with an unspecified drug before a meeting with a military lawyer. Latif told Remes later (according to attorney notes, as described in the Truthout article) that “they wanted to have no one report” his death. On April 25, 2011, whistleblower organization WikiLeaks published formerly secret assessments drafted by Joint Task Force Guantanamo analysts.Latif’s nine page long assessment was drafted on January 17, 2008 and signed by camp commandant Mark Buzby, and it recommended that he be transferred out of Department of Defense control. Historian Andy Worthington, the author of The Guantanamo Files, writes that the 2008 assessment repeated earlier recommendations that Latif be released. Worthington reported that in addition to being cleared for release by Joint Task Force Guantanamo, and by the US District Court Judge Henry Kennedy, Latif had been cleared for release by the Guantánamo Review Task Force that President Barack Obama had set up when he came to office in 2009.
n September 10, 2012, Latif died at Guantanamo. He had been held there for 10 years, 7 months and 25 days, after arriving there on January 17, 2002. On September 10, camp authorities informed the press that a detainee held in the punishment cells of Camp five had been found dead early in the afternoon of September 10, but did not reveal the detainee’s name, and stated that the cause of death was not apparent. The next day it was acknowledged the prisoner was Adnan Latif, and later a military autopsy reportedly declared suicide the cause of death. The results of a full Naval Criminal Investigative Service investigation were not expected to be known until sometime in 2013. Before the publication of Latif’s identity, Wells Dixon, a lawyer who helped several Guantanamo detainees with their habeas corpus petitions, described the captives’ feelings of despair, which he attributed to recent judicial reverses. A death at Gitmo Adnan Latif’s case shows the need to end our Guantanamo experiment. – OP-ED by Marc Falkoff published in the Los Angeles Times. ^ a b “Military Identifies Guantánamo Detainee Who Died”. Washington, DC: New York Times. September 11, 2012. ^ Marjorie Cohn (2012-06-20). “Hope Dies at Guantanamo”. The Jurist. Archived from the original on 2012-09-11. ^ a b “Adnan Farhan Abd Al Latif, Guantanamo Detainee, To Be Released For Lack Of Evidence”. Washington, DC: Huffington Post. August 16, 2010. ^ a b “U.S. military reviews ‘enemy combatant’ use”. USA Today. 2007-10-11. Archived from the original on 2012-08-11. ^ “Latif Autopsy Report Calls Gitmo Death a Suicide: Questions Remain”. truthout. November 26, 2012. ^ Carol Rosenberg (2012-09-12). “Dead Guantánamo detainee won, then lost federal court-ordered release”. Miami Herald. Archived from the original on 2012-09-13. Retrieved 2013-05-19. ^ a b Margot Williams (2008-11-03). “Guantanamo Docket: Allal Ab Aljallil Abd Al Rahman”. New York Times. Retrieved 2010-03-30. ^ “Kennedy Ruling”. Empty Wheel. August 16, 2010. ^ “(No. 1:04-cv-01254)” (pdf). CADC. October 14, 2011. Retrieved 2013-05-19. ^ Joe Wolverton (2011-11-14). “D.C. Court of Appeals Overturns Release of Gitmo Prisoner”. New American. Archived from the original on 2012-09-13. ^ Benjamin Wittes (2011-11-09). “Latif: A Very Big Deal”. Lawfare. ^ a b c “Poems from Guantanamo”. Amnesty International USA. December 12, 2007. ^ a b “Dead Guantánamo detainee won, then lost court-ordered release”. Miami Herald. September 11, 2012. ^ a b “New abuse claims at Guantanamo”. Al Jazeera. 2009-04-17. Archived from the original on 2009-04-17. ^ a b Ben Fox (2009-05-11). “Lawyer: Gitmo prisoner slashed wrist, hurled blood”. Associated Press. Archived from the original on 2009-05-11. ^ “Lawyer: Latif Letter About Guantanamo Speaks From the Grave”. Truthout. December 10, 2012. ^ “WikiLeaks: The Guantánamo files database”. The Telegraph (UK). 2011-04-27. Retrieved 2012-07-10. ^ a b “Guantanamo prisoner who died challenged his confinement, was rebuffed by Supreme Court”. Newser. 2012-09-11. Archived from the original on 2012-09-11. ^ “Measurements of Heights and Weights of Individuals Detained by the Department of Defense at Guantanamo Bay, Cuba (ordered and consolidated version)”. Center for the Study of Human Rights in the Americas, from DoD data. Archived from the original on 2009-12-21. ^ a b “US says a prisoner has died at Guantanamo; investigation pending into cause”. Washington Post. 2012-09-10. Archived from the original on 2012-09-10. ^ “Latif Autopsy Report Calls Gitmo Death a Suicide: Questions Remain”. Truthout. 2012-11-26.